1.3 How to Check NIOS DELED Registration Fee Payment Status? 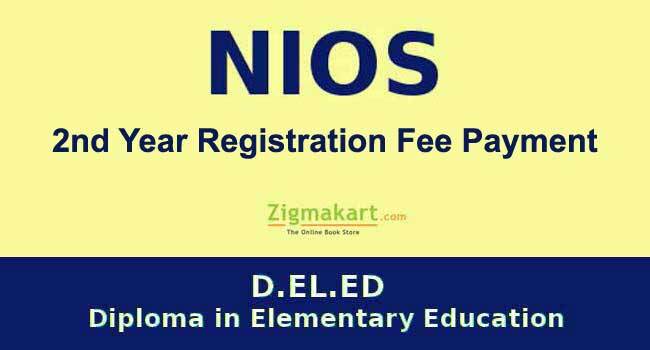 NIOS DELED 2nd Year registration fee submission process has been started online from 7th June 2018. The last date to submit NIOS DELED online registration fees for 2nd year is 7th July 2018.It means the National Institute of Open Schooling has provided a complete one month for already enrolled D.El.Ed. Teachers to apply for registration in the second year by submitting Rs.6000/- fee online.The notification regarding online registration can be checked online on the official website. Before proceeding further with the NIOS DELED 2nd year online registration process, We would like to inform all the enrolled D.El.Ed. Teachers that it is mandatory for all of them to fill up registration form and submit registration fee for 2nd year to continue their studies in this programme. Each teacher has to pay a total fee of Rs.6000/- to register him/her for II Year.As we have already mentioned above,there is only one last date after which NIOS will not accept fee with or without any late fee charges.So, We advise teachers to take this notification seriously and submit their fee online as soon as possible before the last date of submission. The teachers who had not appeared in the 1st semester examination or those who may not be able to pass out first semester exams are also required to register them for the 2nd Year pay the fees before 7th July-2018. After declaration of the first semester results, the unsuccessful candidates can appear in the subsequent examination of 1st Year after due registration for exams. So, let’s start discussing the process to submit 2nd year NIOS DELED registration fee online.To make it easy for the teachers to understand the fee submission process. Step 3: In the next step, you have to click on the “Submit” button. Step 4: As soon as you hit the “Submit” button, you will be immediately redirected to payment page where you have to make online fee payment. Step 5: The applicants will get “payment is successful” message on successfully making the payment. They are advised to take print out of same. How to Check NIOS DELED Registration Fee Payment Status? We hope all the teachers who are enrolled in NIOS DELED programme 2017-19 will find it easy to submit fees online for second year registration. If they find any difficulty, please let us know by making a comment below the article.